The Stealth 2 tent from Gelert is advertised as a “great lightweight, backpacking tent with lots of front storage, and the ideal travelling partner” so sounds like my sort of tent. I decided to take it to Chamonix in the Alps with me for a week of testing. This tent is advertised as a two man backpacking tent, but I used this tent mainly on my own, with a weeks supply of climbing and mountaineering kit which I was rotating and repacking every day. I did get two of us in sleeping bags to lie in the tent and it was nice and cozy, but with enough room to avoid rubbing against the sides. There was some space down the bottom for a large bag, but noticeably the porch was the main space left for storage, and supplied more than enough for two. On my own I could change, pack bags, check gear and still have room to prepare food. For me, the available space in the porch makes this tent very usable, and the sleeping compartment can be zipped off to conserve body heat in colder weather. The flysheet is made from 190T Polyester with a waterproof PU coating and looks well stitched and has taped seams. As with any tent, this is the most important layer, especially if using it in unpredictable UK weather. The flysheet houses the poles for the frame of the tent, therefore it is the first layer to be put up. Three poles slide in to small colour-coded sleeves on the flysheet which gives this tent its shape, this is further enhanced using the clips and holes on the corners. Each corner or seam on this flysheet has an adjustable fabric strap with a hole for putting the peg through. I like this feature as it feels tough and secure when you are putting it up, peace of mind in stormy weather too. There is also a window in the porch area which you can uncover to keep an eye on the weather, or other campers! On the flysheet is says that the tent is fire retardant, I haven’t tested this out so I will have to take their word for it! 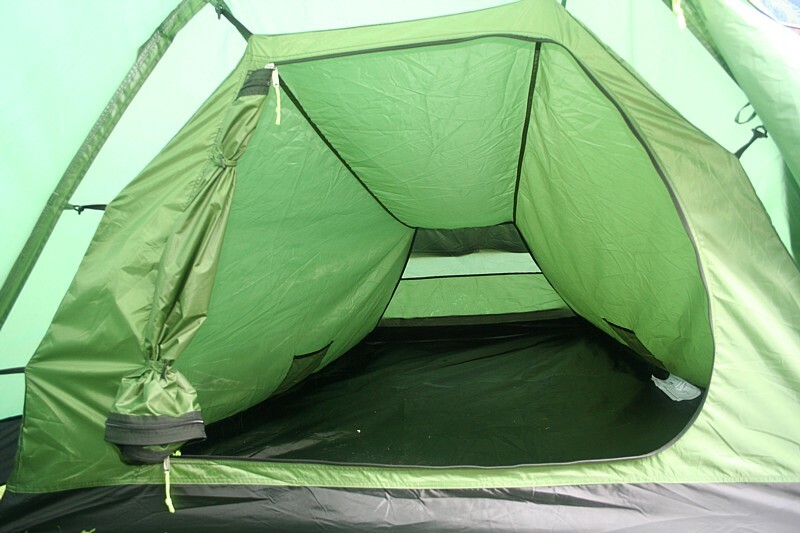 The inner tent is also made from 190T breathable Polyester, and is fairly small for the size of the tent due to a third of the tent being the porch. The inner tent is attached to the outer tent by clips or snap buckles in the corner, and small loops and toggles at the top, so hangs from the inside of the outer, which is the main shell of the tent. The groundsheet is built in to this and the whole thing is held fairly well away from the edges and flysheet. It feels cosy inside and I felt comfortable in this tent as the weather howled outside, and it doesn’t take long to warm up with two in either. Inside you have the usual pockets for valuables, and the door has a mosquito net which can be zipped up separately from the main door panel. To save on weight with this tent, the ground sheet is fairly thin so my one worry would be tearing this on rocky, gravelly ground, although I didn’t have water coming through and with a thermo-rest or equivalent, you will be as comfy as in any tent. There is a separate ground sheet which feels more hard wearing for the porch. There is one door in to this tent located on the side of the porch which has a storm flap attached to it. This gives you easy access in to the porch area, and one thing I found useful about a side entrance was that is stopped the wind howling down the length of the tent. Obviously it still blew in, but it didn’t have such a drastic effect on the shape of the tent! The porch on this tent was a winner for me as not only does it give you much needed storage in a smaller tent, but when the weather turns nasty, like in the Alps one afternoon. The porch became a communal area for three people, and was also where I packed my rucksack for climbs. The doors all roll up, but if you peg them out the canopy would also act as a sunshade and a nice place to rest under after a hard climb. This tent is fully sealed once zipped up and has a midge net on the door, not only does it stop the little blighters having a free meal when you asleep, but allows you to get fresh air in on warmer nights. This came in really handy again while resting in the afternoon after a climb. 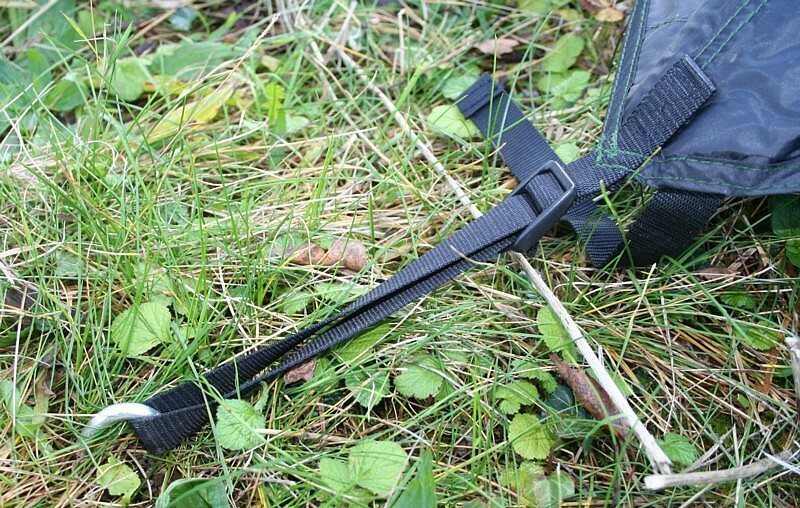 There are three 8.5mm diameter lightweight poles, which are connected together with elastic through the middle. Each pole has a colour on it to aid with putting the tent up and they slot together very easily. The lighter poles get, the more I wonder about the strength of them, but we were caught in a storm one afternoon and the poles flexed a little, but stayed well in position. They also pack away neatly. The pegs are the standard peg shape, made of aluminium, lightweight and easy to use. This makes them a little big to go ultra lightweight backpacking, but could be easily replaced with a smaller set. I did get a spare though! The guy lines are one thing I’m not entirely sure about, they work really well and they are positioned really well around the tent, but illuminus yellow just isn’t my cup of tea! Having said that they do stand out at night so will help you avoid the tripping over and swearing routine. I have put it up a few times on my own and on average it took me around 14 mins. 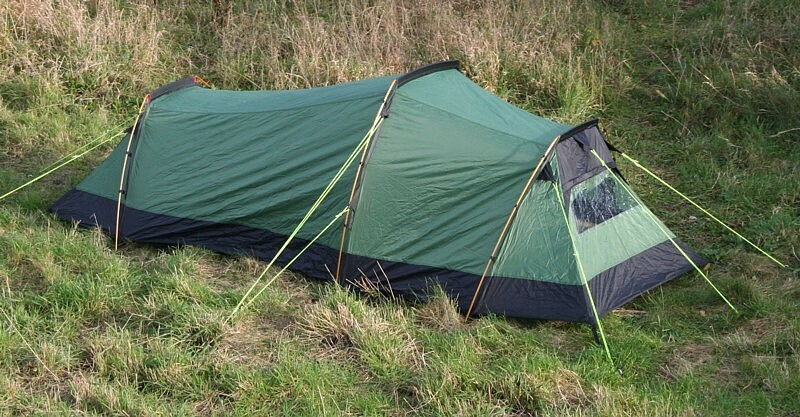 This tent has a RRP of £134.99. This isn’t the lightest tent on the market at 4.2kg, but for a two man tent it certainly offers a great amount of space in the porch, albeit losing space in the sleeping area, but I found it warmed up quickly and actually felt quite snug. It feels well made, sturdy when pitched, and although the bright yellow guy lines aren’t to my taste I thought the tent was over all very usable, comfortable and as with most of Gelert’s gear, good value for money. 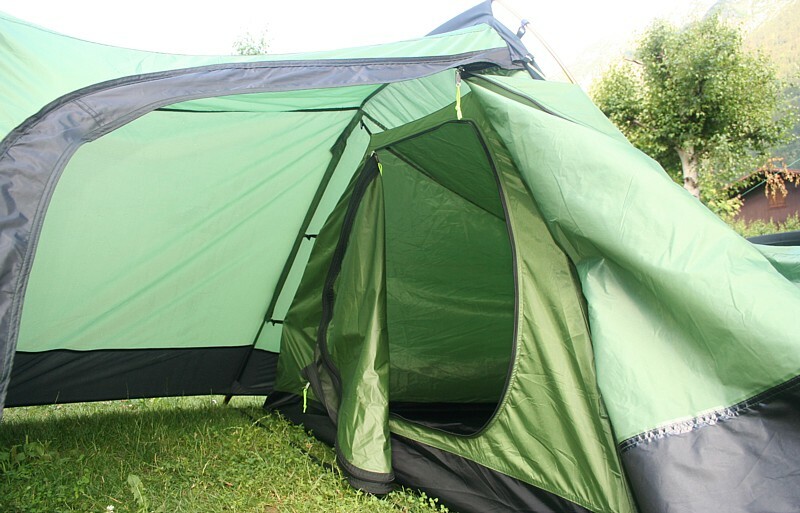 Although I have pointed out a few minor things with this tent, they are purely aesthetically. In fact the performance of this tent in the Alps that week and on trips since has been very good, and has taken over a very well known brand tent I was using before. Mainly because of the usability.